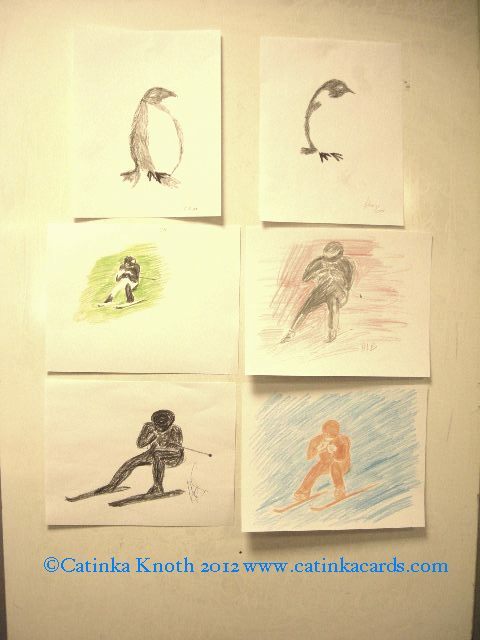 Can you see how penguins with their black tuxedos are a bit like winter sports figures in colorful outfits? 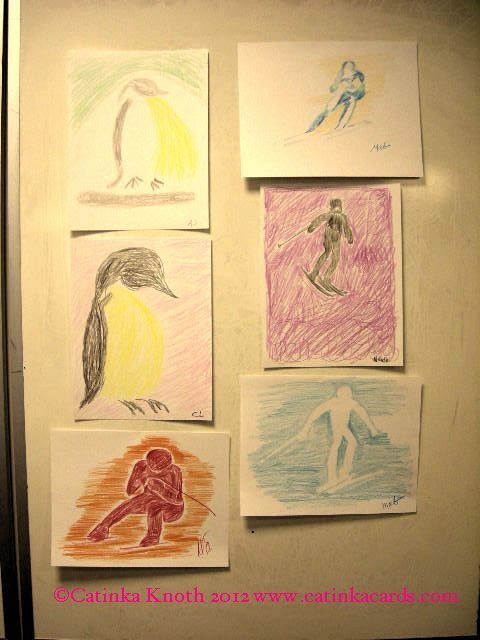 The object was to draw these subjects by coloring them in as if they had an invisible outline. 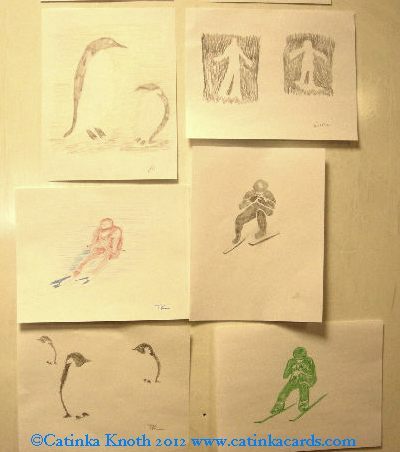 We did a second version where we colored in a background up to the imaginary outline of the skiing figure (drawing the negative shape). One ends up with something like that cartoon coyote when he gets slammed thru a wall and leaves a big hole shaped like him. 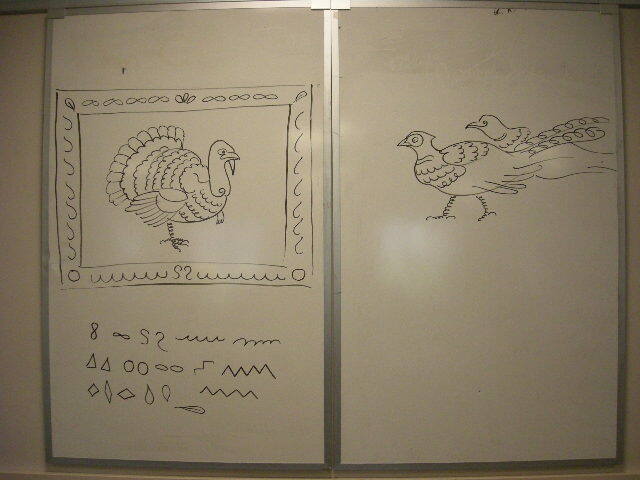 The final drawing project was to make a drawing combining the two methods. Demonstration drawing of a coastal Maine poppies scene from the kids class, followed by the kids' versions of it. We draw the frames before the drawing. In the guise of ornamentation we get a bit of shape and markmaking practice in. It is also good warm-up. Ideally there would be lots of time spent on this kind of practice - on a daily basis. Here is my demonstration watercolor of the coastal Maine poppies scene and a colored pencil version of it. 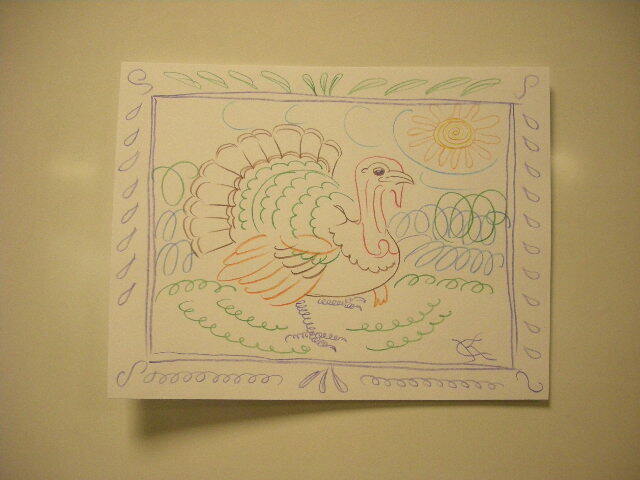 This is from the demonstration series for adults, at the Rockland Library. Tomorrow we'll be doing a beach roses scene. 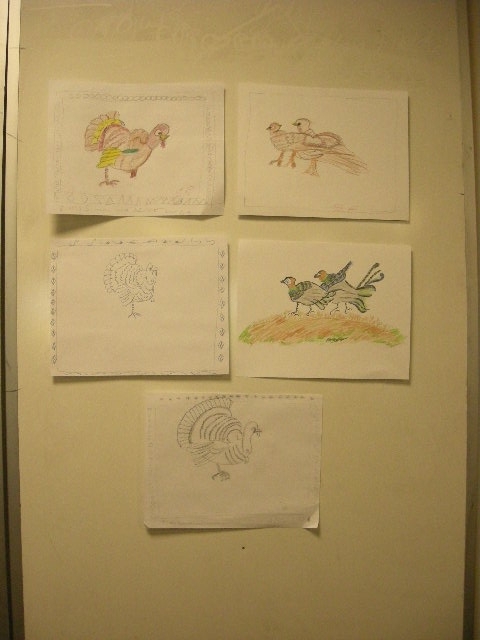 You can see some of the student drawings in colored pencil/crayon below. The two cats lesson starts with drawing a border to create a frame. 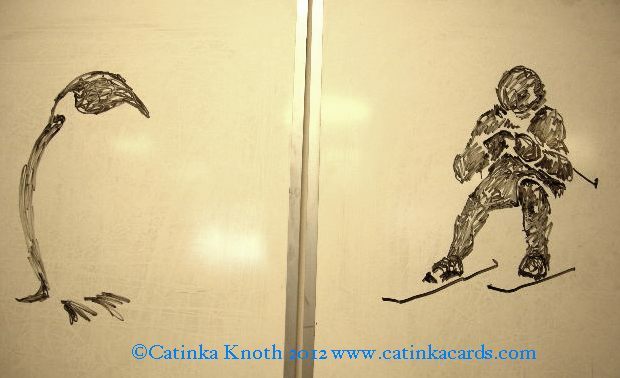 Decoration in the frame gives you practice with cats eye shapes, which also look like leaves. The classes did this on St. Patrick's Day, so the corners have shamrocks. Decoration in the side panels is a modified version of celtic scrollwork. This provides practice of repetition and is good for developing fine motor skills. 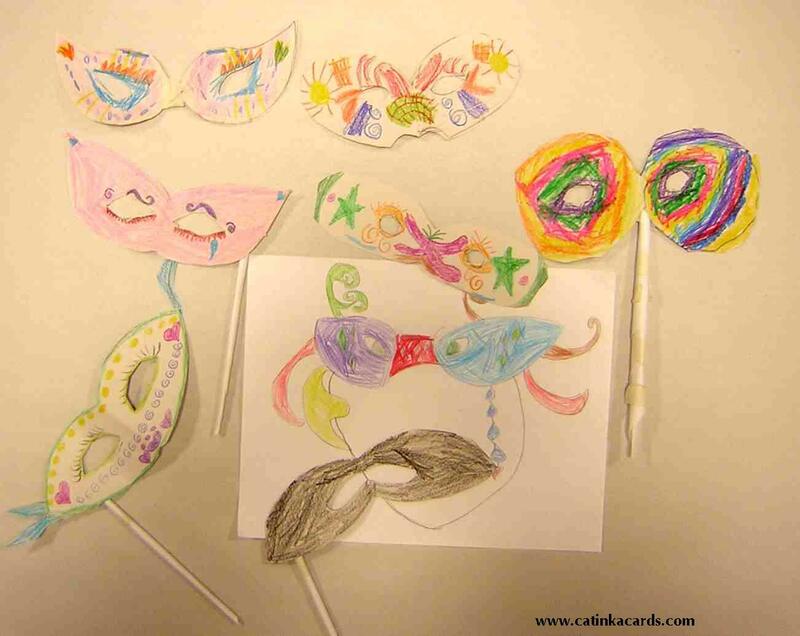 Scroll down for the links to download pdf files of these "how to draw cats & tigers lessons"
Let's Draw and Make Mardi Gras Masks! 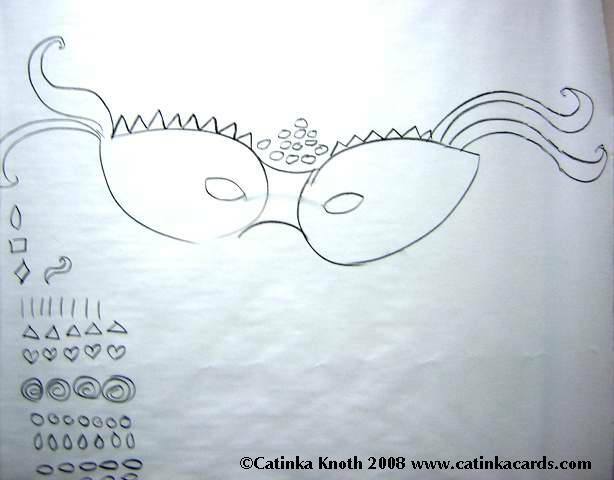 The kids drew mardi gras masks working from my demonstration drawing, a basic eye mask shape. We brainstormed some pattern ideas (lower left hand corner). They put designs on their mask drawings as they wished and went to town coloring. Then they made real masks from a stiff paper. They folded the paper, drew their own basic 'lens' shape with eyehole shape, and cut this out. Before they cut one must check that everyone has drawn the lens off the fold. The tricky part was cutting out the eyehole. It needs to be pinched a bit and snipped in order to get the scissor in the hole. Once shown, every child was able to do it alone, even the 5 year olds. They do need direction, without much talk, on how to hold the scissors... I made straws out of paper strips rolled on the bias for mask sticks. A little piece of tape at the end keeps the strip tightly rolled. The stick can be taped to the back of the mask. Click the link below to see the kids' masks.